At a launch event this morning here in London, the mobile carrier “3” and sister company INQ Mobile unveiled the much anticipated “Facebook phone”. That’s not its official name, nor is it an official offering from Facebook — although the social networking site did have a hand in the phone’s deep Facebook integration. Alongside the built-in Facebook client, the device — dubbed the INQ1 — includes apps for Windows Live Messenger and Skype, a web browser, widgets for Google and eBay and others, as well as music site Last.fm being integrated into the phone’s media player (“scrobbling” of tracks only not actual streaming). However, its the way in which Facebook and the other included social apps have been integrated with the INQ1 that stands out. For example, a user’s Facebook friends list is integrated with the INQ1’s address book and SMS messages show up alongside Facebook messages. Windows Live Messenger and Skype also have similar integration. The result, as INQ’s website states, is that with the INQ1 you “always stay connected”. Imagine a world where your social life didn’t end once your computer shuts down. Where you’re connected with your friends – anywhere, anytime. That’s music to Facebook co-founder Mark Zuckerberg’s ears — he even made an appearance at today’s launch via satellite from California. However, as Om Malik notes, one potential flaw of the INQ1’s web centric mission is that its candy bar form factor doesn’t allow for a QWERTY keyboard. Instead users will need to interact with all the included messaging applications via a 12-key dialpad. That’s a potential deal breaker for me. 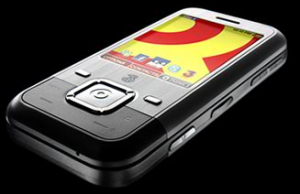 Technology-wise, the INQ1 is based on Qualcomm’s 6260 chipset and uses the Brew OS, although The Guardian reports that the handset’s maker did consider Google’s Android OS but concluded that it would require a more powerful and expensive processor, defeating the goal of producing a low-cost alternative to existing smartphones (see our previous coverage). To that end, on UK carrier “3”, the handset will be free on an 18-month contract, with a tariff of £15 a month ($22). This includes unlimited Facebook, Skype and Windows Live Messenger usage and up to 1 GB of web access, unlimited emails, unlimited texting, and unlimited calls to other “3” customers, plus 75 minutes of talk time to competitor’s networks. I’ll have a full review of the INQ1 as soon as I get my hands on a unit, hopefully in the next few weeks.